Compliments to you Chenjerai (see left) for your work in helping to organize the recent Forum. That must have involved a lot of work behind the scenes…. Thank you for the welcome remarks and yes, there was a lot of work behind the scenes. 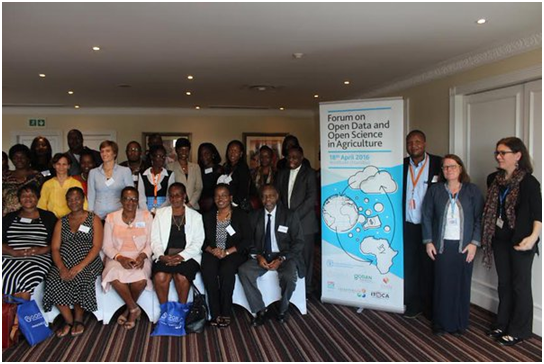 At the end of January 2016 I gladly accepted the ITOCA’s request to be the logistical organizer of the Forum on Open Data, Open Science and Open Access to Information in Agriculture in the Context of Sustainable Development Goals (SDGs). 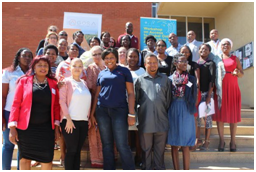 An AGORA Training Workshop followed at the University of Namibia (UNAM), 19-20 April 2016. On a logistical front I helped find the venues and made bookings for both the Forum (FODUSA) and the AGORA Training workshop. I also identified public institutions and individuals that could participate at both events, organized caterers for the AGORA workshop and transport for the forum and workshop facilitators. In addition, my role included compiling a report to cover both the FODUSA and the AGORA workshop. I am still busy compiling the joint final report for both (forum and workshop) as I respond to your interview questions…. Senior-level panelists spoke at length on an array of topics about open data and open science in agricultural research. But at a policy level what did you take away from the Forum, and how do you see the outcomes being relevant to UNAM? The opening statements highlighted the importance of science research. They addressed national priorities and needs and their contribution towards the realization of Sustainable Development Goals (SDGs), especially those related to ending hunger, poverty alleviation, gender equality, climate change and health. The importance of easy access to information, and the need for access to knowledge to support national priorities and SDGs was also noted. The first plenary session presentations and discussions looked at research and innovation in support of national development goals and SDGs. The second plenary session discussed initiatives on data and technical information sharing and dissemination using open data and open science for the realization of the aforementioned SDGs. It also highlighted the need for access to data and information, including institutional and national policy implications. The closing session summarized the major outputs from the panel discussions and resolved to enhance knowledge sharing and advocacy on open data and open science. Specifically, the Forum resolved that Namibia must create a National Steering Committee on Open Data and Open Science (OD/ OS) and mandated the Namibia Commission for Research, Science and Technology (NCRST) to coordinate the committee. The representative at the Forum informed the meeting that the NCRST was in the process of formulating a Science, Technology and Innovation (STI) policy. The Forum advised the NCRST to incorporate issues pertaining to Open Access and sharing of research data in the STI policy. 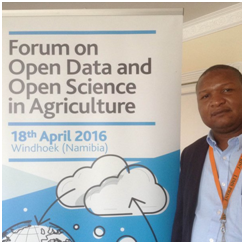 In order to successfully champion the cause, the Namibia National Steering Committee on Open Data, Open Science, Agriculture Research and Development must engage a range of institutions (*see list at end). How widely is AGORA promoted and used at UNAM? Access to Global Online Research in Agriculture (AGORA) is promoted during information literacy (IL) training sessions, carried out by librarians. IL training for students takes place throughout the year and during academic orientation for teaching and research staff. IL training for postgraduate students takes place during faculty seminars, during academic 1st year orientation, and upon request. AGORA is mostly used by students and lecturers from the Faculty of Agriculture and Natural Resources (FANR) and the Faculty of Science. A few nursing science, education and humanities students have also found AGORA relevant to their research focus areas in recent years. What about other agricultural research resources? Agriculture research information is available online through theses and dissertations, research reports, and platforms and databases such as, AGORA, OARE, Google Scholar, Directory of Open Access Journals (DOAJ) EBSCO HOST, JSTOR, AGRIS, TEEAL and Science Direct, among others. Agriculture students have access to all the above resources through the Library website. UNAM students also access agriculture information through organizational websites: FAO, OIE, CTA, SADC FANR, CARDESA, FARA, and Farmers` Unions, etc. UNAM promotes e-learning through the Centre for Open and Distance Learning. Lecturers can deposit lecture notes on student portals through the Moodle E-Learning platform; lecturers can also assess students on-screen. The Web is also awash with free online tutorials on various disciplines, including agriculture. The majority of UNAM students have access to new technologies, but the onus is upon them to continue learning after obtaining their degrees and also apply these skills at work. After UNAM, Namibian graduates can also pursue postgraduate studies online through other agriculture universities globally. As Head of User Services at UNAM you have a great vantage point on how students access research. During your time at UNAM how have you seen user-services improve and innovate in line with better access to research? In 2012 I helped to carry out a study to identify resources required by academics at UNAM. Subscription databases such as, Hein Online and Cambridge Law Reports were added in 2015 following accreditation of the LLB programme. In addition to AGORA and HINARI, OARE was also added to the Research4Life programmes that UNAM has access to. JSTOR was added in 2012. Connectivity to Open Access resources, such as Google Scholar, Biomed Central, DOAJ, DOAB, Free Books4Doctors, among others was established and the above resources are accessible through the UNAM Library website. Following a 2007 User Survey Report (after student complaints and demonstrations) more student PCs were acquired, a new ICT Student Help Desk was introduced, Internet bandwidth increased, and wifi installed inside and around libraries, among other improvements, (although internet connectivity remains poor at some UNAM campuses, especially further from Windhoek). Cumulatively, the above library developments have enabled students and researchers based at various UNAM campuses to access research information online. I conducted an evaluation in 2009 that helped to identify gaps among existing library collections (journals and textbooks). Some of the identified e-journal databases that have been added to the UNAM Library subscriptions list include, Emerald (2011), Science Direct (2011), Sage (2012), and Taylor & Francis (2012). You’re an active member of Open Access week – how is OA promoted at UNAM and what benefits do you see for students? UNAM`s position on participating in open access programmes is articulated in the Scholarly Communications (SC) Policy approved by Senate in 2013. UNAM strives to make the products of all publicly funded research freely accessible to the global community of researchers through the UNAM Institutional Repository (IR administered by the library). In the event where the authors are not funded by the institution or government, and their works are disseminated through subscription based journals, databases, etc., the SC policy advises UNAM academicians/ researchers to negotiate their right to deposit/publish pre-prints through the IR whenever possible. Through funding from the University`s Research Office, the institution supports researchers seeking to publish their peer reviewed works through accredited Open Access journals. Lastly, what’s next on your agenda, particularly in terms of open access to data and science? I’m a member of the UNAM Scholarly Communications Committee (SCC: formerly Task Force). One of the recommendations of both the Task Force and the SCC is that the institution must become a signatory of one of the Open Access declarations, such as the Vienna or Berlin Declaration(s). I also agree with the AGORA workshop recommendation of UNAM becoming a member of the Confederation of Open Access Repositories (COAR). The UNAM Library`s ICT and Training Librarian has just returned from a 3-week digitization (D-Space) training trip in Poland, Czech Republic and Switzerland, where the UNAM Institutional Repository (IR) featured greatly. During the trip UNAM was offered an opportunity to participate in a different local open access and digitization initiative coordinated by the National Archives of Namibia and the National University of Science and Technology (NUST, formerly Polytechnic of Namibia). *: University of Namibia (UNAM), Namibia University of Science and Technology (NUST) International University of Management (IUM), National Commission on Research Science and Technology (NCRST), International Federation of Library Associations (IFLA) Ministries/ Government of the Republic of Namibia (GRN) departments, such as, Ministry of Agriculture, Water and Forestry (MAWF), Ministry of Environment and Tourism (MET), Ministry of Fisheries, Office of the Prime Minister (OPM), National Planning Commission (NPC), Namibia Statistics Agency (NSA), Ministry of Information Commission Technology (ICT), Directorate Namibia Library and Archives Services (NLAS; National Library of Namibia is part of NLAS), Ministry of Education, Farmers Unions (Namibia Farmers Union (NFU), and Commercial Farmers Union (CFU), and Non-Governmental Organisations (NGOs).